Autumn has officially begun in the northern part of the world, and this week's royal jewels certainly reflect the changes in the season. Be sure to vote for your favorite jewels in the poll below! 10. The Duchess of Cambridge debuted a new pair of earrings at a Rugby World Cup match on Saturday: Catherine Zoraida's Fern Hoop Earrings. 9. Also on the gold leaf earring bandwagon: Queen Mathilde of the Belgians, who wore a pair at a meeting with the media in Brussels on Tuesday. 8. Queen Sofia of Spain got the gold leaf memo, too: she wore a gold leaf brooch for an audience at Zarzuela Palace in Madrid on Tuesday. 7. Sofia's daughter-in-law, Queen Letizia of Spain, opted for her ruby cabochon drop earrings for a visit to a vocational school on Thursday. 6. On Saturday, Queen Maxima of the Netherlands wore a dramatic pair of gemstone drop earrings for the final celebration of the 200th anniversary of the Kingdom of the Netherlands. 5. 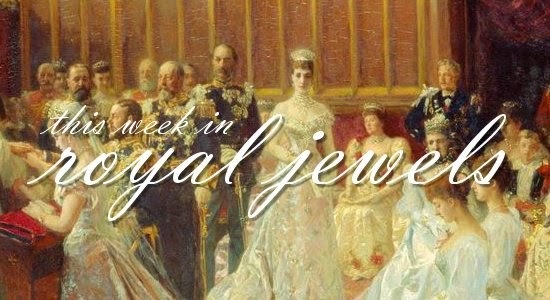 At the same event, Princess Beatrix of the Netherlands wore her gorgeous pair of citrine and diamond earrings. 4. At the United Nations in New York on Tuesday, Queen Maxima selected gray pearl earrings and a coordinating necklace. 3. Queen Rania of Jordan was also in New York this week. On Monday, she wore a trendy pair of earrings to a luncheon at the Pierre Hotel. 2. Also in New York: Queen Silvia of Sweden, who wore pearls, diamonds, and emeralds at the World Childhood Foundation's Thank You Gala last Thursday. 1. My top spot of the week goes to another attendant of the World Childhood Foundation Gala: Queen Rania, who wore an absolutely stunning (and really visually interesting) pair of diamond earrings.